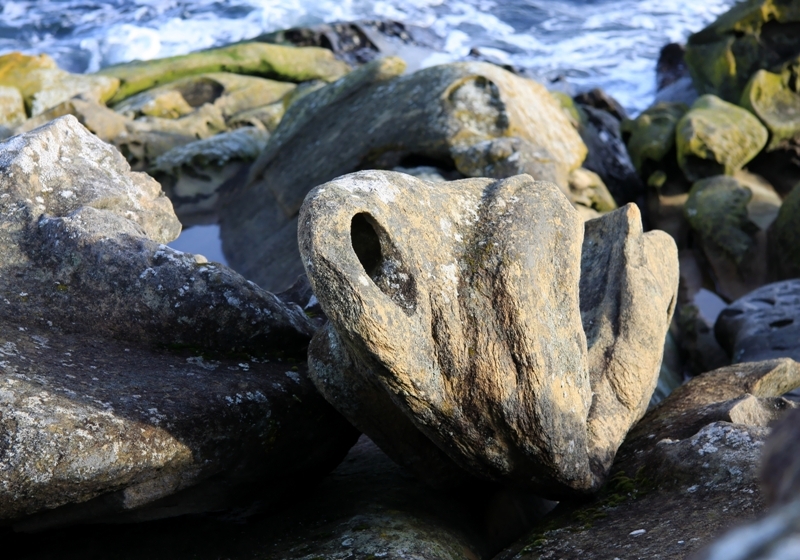 Some days like yesterday, rocks play a prominent role in photo shoot. There are those in a spot of sun deep in the forest floor. There are those providing a backdrop for an old fir tree. There are those clustered together on shore. 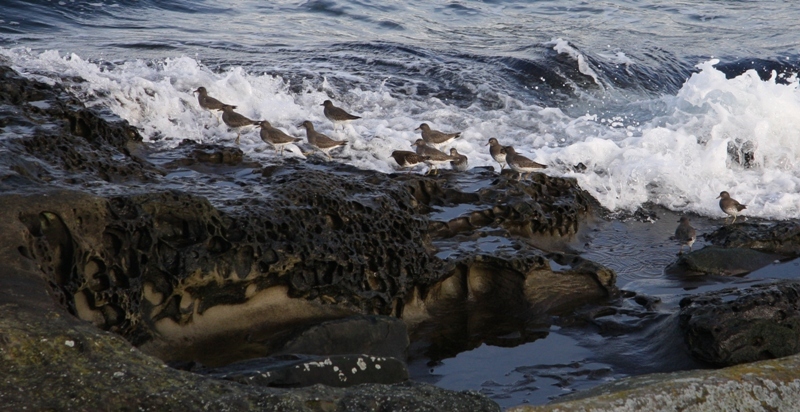 Then there are those providing a foamy footpath for Surfbirds. Rocks – all of them sandstone rocks. Sprout question: What is prominent in your creativity today? 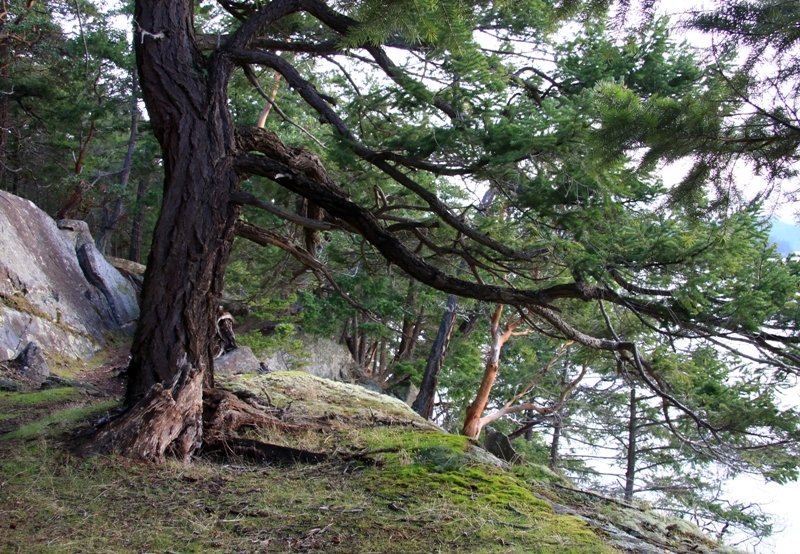 Terrill – I’m especially drawn to the photograph “There are those providing a backdrop for an old fir tree.” Wonderful. Yesterday our thoughts must have been linked together by some type of creative umbilical cord because I had rocks on the brain too. I went to Moonlight Beach and took photographs of rocks (first one, then added another, and so forth, until I had 9) to help support the “Numerologically Speaking” class I’m presenting in January when I show my readers how to calculate their Life Path number and then present a separate post for each of the Life Path numbers, 1 – 9. Yes, he still has his driver’s license and has no intention of giving it up, or sitting in the passenger seat while someone else drives. Oh boy Laurie I don’t envy you! I am the worst passenger ever. I have had my son pull over and get out of the car, come around the the passenger side and make me get out and get in the driver’s side because I was such an uptight annoying passenger. My daughter used to make deals with me for how many block I could go without flinching or stepping on those imaginary breaks. Now that they are in their 30’s and have been driving for years it is a bit better – but not much. So I am sending you calm relaxed energy – the kind where all the other cars seem to float out of your way and your father remembers where his breaks are and keeps a good distances from the bumper of the next with smooth graceful lane changes. I am imagining your trip being a breezes. You are a smiling, relaxed and chatty passenger. Now – please post and let us know you made it home in one piece! Terrill – We just got back. The rain and the fog didn’t help the situation. Neither of us actually shouted, but I was white-knuckled the entire time. At one point the car hydro-planed and I asked him to slow down. “I’m driving the speed limit!” he replied. I explained that the posted speed limit is for ideal conditions. When we can’t see past our front bumper due to rain and fog we aren’t required by law to drive like a bat out of hell! Well so much for my imaginings! I am glad that you are home safe now. Good thing there is no alcohol in house… a drunk Laurie blogging may be a bit confusing. Readers would likely report that your identity had been stolen. Hi, Terrill, I’m still laughing at Laurie and her anticipation of a hair-raising ride with her Dad, been there, done that, got the scars to prove it. I love rocks, I adore rocks. I cannot see three rocks with out putting one atop another. A rocky beach, the scree at the foot of a mountain, a creek bedded in water-worn rocks will fuel my imagination with walls, flowerbeds, cairns, anything made of stone. My biggest problem, of course, is that they are so darned heavy. I am not content to let them lie, I want to take them all home. And play with them, paying no attention to ripped fingernails, smashed toes or aching back. Thanks for sharing these. Sandi I have hauled may a rock home for flowerbeds and just because I like them but I don’t think I can even touch your enthusiasm. There is something very soothing about playing with rocks. I think more of us should follow your example. 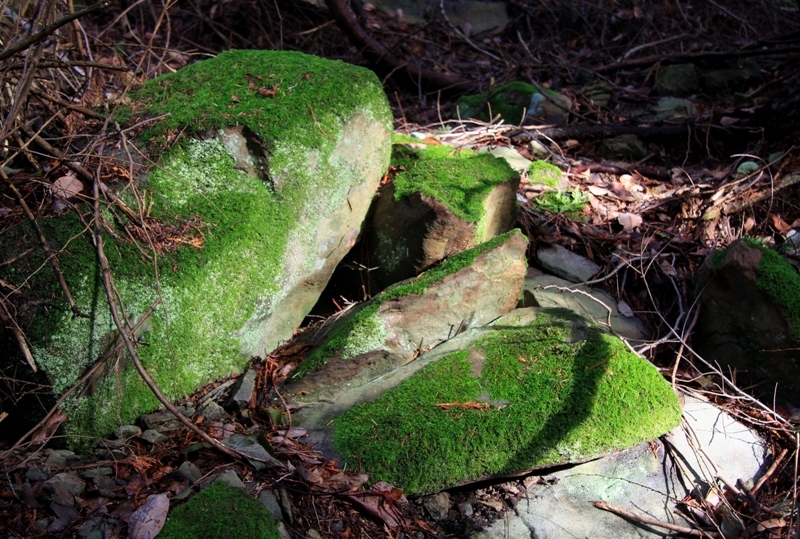 I love the moss covered stones. I want to be there.